Sun-safe hats aren’t being worn by nearly half of Sydney’s primary school students, according to a new report commissioned by the NSW Cancer Institution and Cancer Council. Observers watched 8000 Sydney students in government schools in western Sydney over three months and found that only 60 per cent wore sun-safe hats. The NSW Department of Education considers Legionnaire, wide-brimmed, and bucket hats to be sun-safe. Previous data collected by the Cancer Council recorded 80 per cent compliance with sun-safe policies but that was based on self-reporting from principals. “Whenever you have people self-reporting on behaviour, it’s always over-reported,” said Dr Dean Dudley, senior lecturer for health and physical education at Macquarie University and the lead author of the new report. Dr Dudley said that the hats’ designs had to be conducive to play for students to actually wear them. The students praised hats that could be folded up and put in pockets but considered Legionnaire hats to be “daggy”. Girls were 1.6 times more likely than boys to wear no hat at all. In a fifth of the observed schools, less than 7 per cent of students were wearing sun-safe hats. Many of these schools had students from disadvantaged backgrounds. “We’re talking about some of the most impoverished schools in metropolitan Sydney. One school was on lockdown when we were there collecting data,” Dr Dudley said. For other schools, sun-safe hats aren’t enough. Our Lady of Fatima Catholic Primary School in Kingsgrove not only adopts a “no hat, no play” policy but has also introduced sunglasses as an optional part of the school uniform. 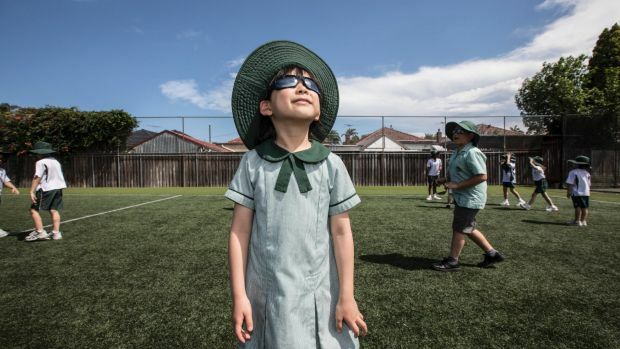 “A couple of ophthalmologists approached us because they were seeing younger and younger children with damage to their eyes caused by the sun,” said Anthony Weir, the school’s principal. The school’s glasses, which cost around $70, were developed in collaboration with eye surgeons because quality alternatives all cost hundreds of dollars. The NSW Cancer Institution and Cancer Council have recently approved a new study that will look at increasing the number of students wearing sun-safe hats. A Department of Education spokesman said “the Sun Safety for Students Guidelines advise that school communities work together to take approaches and actions to protect students from the sun”.